The Trumpf 3000R CNC punch press holds all its tooling in tool holders held on a rail at the back of the machine along with the sheet holding clamps. The tooling sets can easily be swapped over from job to job and usually a tooling set up only takes a few minutes making it the perfect machine for small batches and prototypes but also very quick when punching larger batches of work. For a CNC punch press to produce a hole a tooling set consisting of 3 separate parts is needed, a punch, a die and a stripper plate. 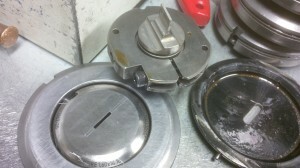 The punch fits through the stripper plate and then the sheet metal and finally into the die. There is a very close match between the punch and die with a small clearance on the die to allow the punch and material to fit through e.g. 0.2mm for 1mm mild steel. The stripper plate is designed to help strip the sheet metal off the punch once it is pulled back out of the die before moving to its next position to punch again. The whole punching process only takes a fraction of a second which makes this machine very productive on any sheet metal work that needs a lot of holes punched into it. Here we have a simple example of mild steel having been CNC punched with a couple of different sized round tools and some overlapping rectangular tools to produce the slots at different angles. You can see the nibble marks where the tools overlapped slightly in cutting the shape as we didn’t have the exact tool sizes the customer had designed in their drawing. This is the great advantage of CNC punching with a Trumpf machine in that it’s so easy to nibble with tools to produce the shape you need without damaging the standard tools and dies. We have many standard tools which should satisfy most peoples needs but if you are not sure please give us a call and we will be happy to discuss your design needs and how we can help you. Sheet metal fabrications for us here at V and F Sheet Metal can be small mild steel welded brackets, welded aluminium enclosures or stainless steel housings such as these shown here. These housings have been manufactured from 1.5mm thick 304 stainless steel sheet by laser cutting and folding and then TiG welding. The final housing and lid assembly has been spot welded together with a stainless steel piano hinge. The final fabricated assembly is then polished to a high shine before sending to the customer for assembly of electronics equipment. 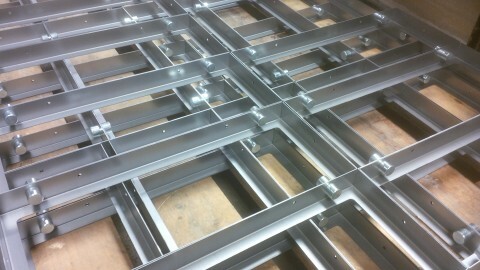 Mild steel frame works waiting to be TiG welded and cleaned off smooth before being powder coated. The large zinc plated and clear passivated hank bushes pressed into the frames are tank bushes and are blind on the inside so no water can get into these frame fabrications once they are used outside as LED display housings. Sheet metal fabrications can come in many shapes and sizes and we are always adding to the range of work we do for people so please come back and read some other posts for more information or call us if you have a specific fabrication project in mind. We are happy to discuss your needs and try and improve your project for manufacturing saving you time and money. 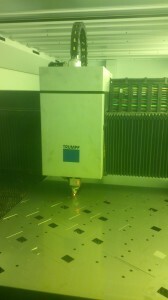 Using a Trumpf 3030 3KW fibre laser able to cut mild steel, stainless steel, aluminium, brass and copper. Maximum sheet size is 3M x 1.5M, please ask for thickness details as this depends on material type. Using both Trumpf 200 and 3000 CNC punch presses to punch out all the same materials covered by laser cutting but also anodised reflector materials, pre-painted steels and plastic coated materials. Maximum sheet size is 3M x 1.5M, please ask for thickness details as this depends on material type. Using both Trumpf 7036, Edwards Pearson and Guifil CNC press brakes to bend all the materials cut by laser cutting and CNC punching. Maximum bend length is 2.5M. Using the latest Kempi equipment to TiG and MiG mild steel, stainless steel and aluminium sheet metal fabrications. Spot welding facility with new machines being added early 2015. Used to pierce, drill and form all sorts of small brackets, sheet metal panels and lighting reflectors. Using a Haeger bush inserter in a range of sheet metal materials and thicknesses. Using Radan software to 3D model complex and simple sheet metal work, create flat patterns and tool items with full production programs for laser cutting and CNC punching. I have shown above the main stages we go through in creating a simple folded sheet metal box in 3D software, develop the flat pattern and tool it ready for CNC punching. The stages are taken in producing a programmed part ready for CNC laser cutting and we can swap parts from machine to machine to suit the design of part and importantly to suit the flow of orders on any particular machine. Most of these stages are only a few clicks of a mouse so a component as simple as this can be developed ready for CNC punching within a few minutes with the correct cut size to bend back up to the box required. We use Radan sheet metal software for this process being one of the best you can buy. 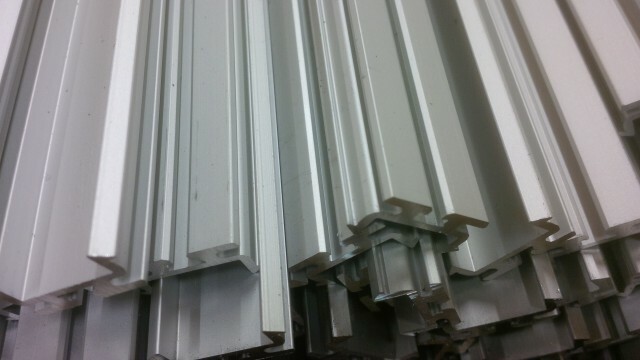 Typical aluminium extrusion sawn up to length. 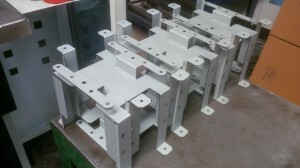 We can saw up aluminium angles, bars, rod, box section and customer cross sections such as these parts. The saw blade rotates at a very high speed enabling us to was through aluminium sections with little or no burr after cutting eliminating the need for de-burring operation. Sections up to 6M can be handled with this saw. This sheet metal fabrication project for several different LED display cases started with a 3D model created in Radan sheet metal CAD/CAM software. All the information for the size of the cases, material thickness and holes positions was taken from our customers 2D DXF drawings. We used many of the inbuilt features within the Radan software to speed up the handling of corner conditions for preparing the joints ready for welding fabrication. We could even try the fit of the cover on the body of the cases, alignment of fixing holes and the ease of inserting the bushes and studs within the software to ensure they would fit once manufactured, welded and powder coated. Once the 3D model had been unfolded and tooled up and a sheet nest created within the software a CNC program was prepared that was used to laser cut the cases from sheets of 2mm thick 5251 aluminium alloy sheet. The cases were folded up on one of our Edwards Pearson 2.5M long CNC press brakes and you can see just how well the software can calculate the size of the developed blank so that it can be folded up without any gaps in the welded seam. The 3D model was created with the correct overlap of gauges at the joint needed by the welders as a weld preparation to enable the weld bead to penetrate the material gauge for a strong seam weld. The larger the component or more expensive the material the more of an advantage it is to be able to go straight into manufacturing without any trials and wasting materials with samples and CNC program adjustments. Unfortunately it’s very difficult to show clearly someone TiG welding due to the brightness of the light given off when the welding arc is struck on the parent metal. You do get a good idea of the processes needed to weld the joints from this image and the others shown here. The welder can only view the welding process through a special glass shield within the welding helmet that is light sensitive and can react to the brightness created of the weld arc darkening the glass and protecting the welders eyes during the whole welding fabrication process. When the welding is being carried out it’s important to penetrate through the gauge of the aluminium to get a strong joint. It’s also necessary in this case as the fabricated joints have to be cleaned off smooth and if the welder doesn’t penetrate right through the joint all the weld strength would be removed when the outside of the joint is ground back which could lead to cracks appearing after fabrication. Although the weld looks messy at this stage it will be perfect once it has been cleaned off as the image shows in the final manufacturing stage. 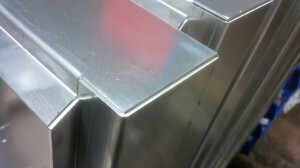 Once all 4 corners joints were welded they could be cleaned up to produce a smooth finish. At this stage they have been ground down to the parent metal and then they will have an orbital sanded finish before being powder coated with then no visible joint lines seen at all. If you have an aluminium sheet metal welded fabrication project that you need manufacturing please give us a call and we will be happy to price it up for you. The speed of a Trumpf 3030 3KW fibre laser is very impressive when cutting thin sheet metal. Here in this video it’s laser cutting 0.9mm zintec coated mild steel sheet which will be used to manufacture support brackets and gear chassis components for the pumping industry. 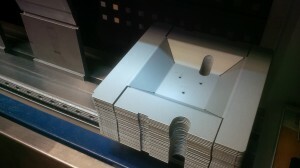 These particular sheet metal brackets did not need any edge de-burring after laser cutting with compressed air due to the clean edge that is produced. Along with the ability to use the whole sheet right up to the edges on all 4 sides it helps to produce very cost effective cutting and therefore cheaper components. As well the the machines ability to laser cut thin gauges very quickly and use up as much of the material as possible to produce components the time taken to change from 1 job to another is only minutes given a great flexibility when it comes to small batches of work or prototyping for customers new designs. 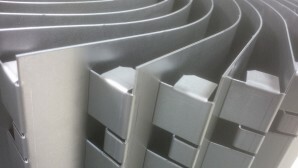 Sheet metal work can be worked in many different ways with a range of manual and computer (CNC) controlled machinery. These small sheet metal components are gear trays designed to hold all the electrical control gear for industrial light fittings. 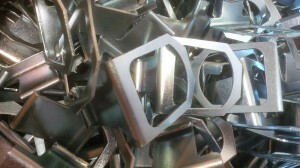 They have been CNC punched out and CNC bend with equipment in our manufacturing factory in Fareham, Hampshire, UK. You can see how quickly a machine like this can form bends in a sheet metal component and within a few seconds many bends have been formed and the component is finished. With set up times of just a few minutes between each component type this type of manufacturing is flexible when producing lots of different sheet metal work during each day. If you have a sheet metal work project that needs to have components bent up there is a good chance that we will be able to help you with the range of sheet metal bending machines that we have here. Please give us a call of send in your drawings for us to quote you. 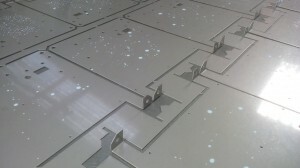 Laser cutting sheet metal nests produced with Radan sheet metal software. Without the need for CNC tooling a laser cutter can cut any shape and nest the close together to save material. Although not show here if we are running several jobs together from the same material and gauge we can fit the onto a single sheet and even within a part with a large open interior area such as this ring. No matter whatever strange shape your design might need don’t be put off because we can probably laser cut it for you whether it’s in mild steel, stainless steel, aluminium, copper, brass, galvanised steel or zintec. Using Radan sheet metal software with our Trumpf 3030 3KW fibre laser is the perfect combination for controlling the design shape and the best fit from any sheet we have in stock or can buy in. If you have a sheet metal component and you want us to laser cut it please don’t hesitate to give us a call or send a drawing to us and we will work out a competitive price for you. Trumpf CNC punch presses can be so flexible when producing thin gauge sheet metal components. 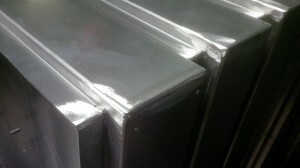 These thin gauge zintec coated mild steel sheet metal panels are part of a flood light fitting cover plate. Inside each panel there is a window being cut out using a 70 x 5 rectangular tool with the waste material falling through the bed of the machine down a chute and into the waste bin. This feature on our Trumpf 3000R CNC punch press enables us to quickly remove the scrap metal without having to stop the machine or leaving it held in place with corner tags that would then need to be removed and de-burred. 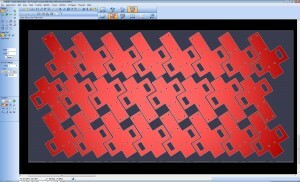 The advantage of this type of production method of laser cutting is the ability to form in features such as standoffs, wall spacing dimples, ventilation louvres, earth symbol stamps, electrical knockouts etc. 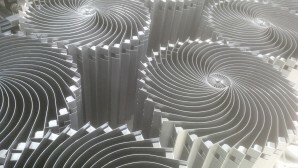 If you have a sheet metal component that needs manufacturing we would be happy to take a look at it for you and quote either for CNC punching or laser cutting depending on the part’s design. 4mm thick mild steel panels laser cut on our Trumpf 3030 fibre laser using oxygen as the assist gas and then bent up. These panels used to be CNC punched out but due to the amount of cleaning up needed to deburr all the edges after punching this became an idea job to be moved to laser cutting when we installed our new laser cutter (Nov 2013). Many other jobs have also been moved to laser cutting if they had complex profiles and some others were left with CNC punching if they had lots of holes or any 3D features such as dimples, formed threads or ventilation louvres. That’s the advantage of having both production methods under 1 roof, we can move jobs around to suit our customers requirements and to find the best use of the technology to suit the design. 1mm thick aluminium ventilation filter holders CNC punched on our Trumpf 200 CNC punch press. These panels are typical of the type of work produced on our CNC punch presses and a batch of 50 off was perfect for the Trumpf 200. 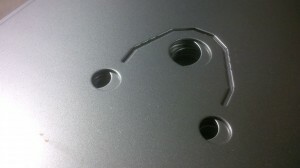 Each hole was pierced with a diameter 3mm punch and die. If the volumes get larger there will be a point when a cluster tool will become cost effective. This type of punch tool can be anywhere from 2 to 50 punches held in one tool greatly speeding up the hole perforating speed of the panel. These zintec panels have been CNC punched out, edge de-burred and then had mild steel zinc plated bushes inserted before sending off to be powder coated. 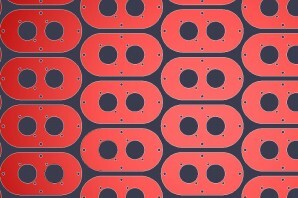 All panels whether CNC punched or laser cut up to 2.5M long or even 3M long if just flat can be produced in house. Need some sheet metal panels for a special project you have or a standard product that you manufacture, please give us a call or e-mail your drawings and we will take a look for you. 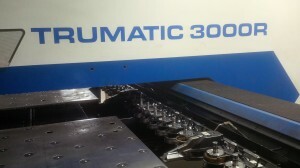 A Trumpf 3000 is the perfect machine for CNC punching small to large batches of sheet metal panels. CNC punching at its simplest is a machine that can move a sheet of metal in a x and y direction and stop at a defined position and pierce a hole. The hole is pierced with a punch that is punched through the sheet and into a die to produce a slug of metal that falls into a waste bin below. There are various methods of achieving this with different tooling systems depending on the manufacturer of the CNC punch press but they all achieve the same result, a hole in a sheet of metal. As well as single holes tooling can be used to combine several holes together to produce more complex geometries and even forms in the sheet such as ventilation louvres, spacing dimples and plunged screw thread positions can be achieved with the correct tooling. The component shown here is a large stainless steel panel being CNC punched out with a protective plastic coat left in place ready to protect the stainless surface in production whilst being bent up. In contrast to the large stainless steel panels above here we have CNC punched much smaller mild steel panels. When hundreds of small panels are wanted together they can be nested with common lines to save material and speed up the CNC punching cycle with less punching. These panels have been held within the sheet by a 0.1mm corner tag which is enough to stop them falling out but not too much so that they can be broken out leaving very little witness which can easily be deburred off after punching. If you have a sheet metal panel and think it could be produced by CNC punching please just let us know and we will be happy to investigate for you, sort out different price breaks and even send you an image of what tooling we would use and how this would look on the final panel. 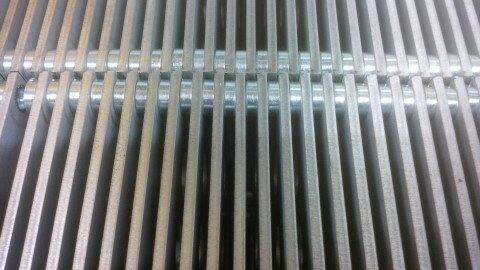 Simple zintec coated mild steel fan decks used within the heat and ventilation industry. Once again it’s that time to take a look at what sheet metal projects are going through our factory and I can’t believe it’s December already, such a busy year. We have such a range of sheet metal projects that I am never lost to take pictures of and show off the projects we have just worked on. They may be complete one offs for customers with bespoke design projects to repeating batches of hundreds or thousands of parts. From the smallest stainless steel spring clip or angle bracket, through mild steel housings, front panels and fully welded assemblies we are always busy producing new sheet metal work for our customers. From laser cutting using a Trumpf 3030 fibre laser (new 2013) and CNC punching to bending sheet metal work up to 2.5M long and welding along with many ancillary production operations (take a look at our plant list pages) we have all your sheet metal needs covered. These bespoke aluminium enclosure housings and covers were laser cut from 2mm thick aluminium and the folded up. 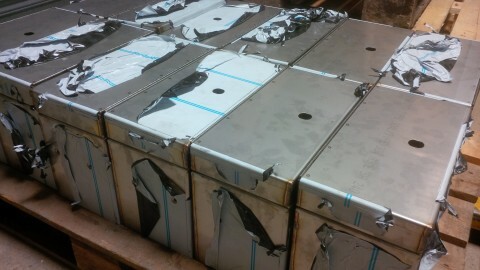 They are shown here before being welded up and cleaned off. These enclosures house all the electronics for LED display boards. All the outer profiles and hole positions were set out in a 3D model created in Radan 3D sheet metal software enabling us to check the fit of the main housing and front as well as all the hole positions before cutting any metal work. 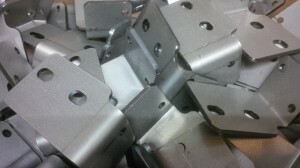 These mild steel brackets have been produced on our Trumpf 3000 CNC punch press. The brackets have M3 and M4 threads tapped into the 3mm thick mild steel parent metal. The Trumpf 3000 has the ability to form threads directly into a pre punched pilot hole. We have several tapping modules to cover the range of standard thread sizes making it a much faster and cost competitive operation than using a standard tapping head in a pillar drill. 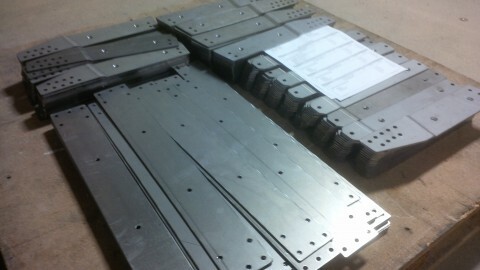 These brackets were then folded up on our Trumpf 7036 CNC press brakes using standard press brake tooling. Should you require any sheet metal work in the new year please give us a call or send over your drawings and we will be happy to help you. 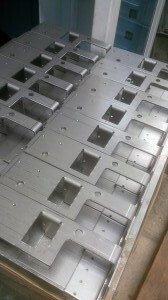 These mild steel housings covers have been manufactured as blanks on one of our Trumpf CNC punch presses. The have then been formed up with a curved shaped tool and then all the 90 degree bends have been added using a Trumpf 7036 CNC press brake. They are pictured here stacked up waiting to be sent to the powder coaters to be painted before going off to the customers to be assembled onto a larger housing that we make. 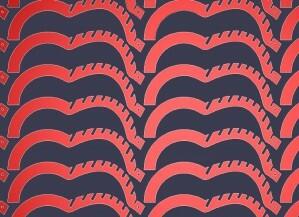 The pattern created here is an efficient way to stack the covers and happens to make quite an attractive image as well. Lovely image of the covers all stacked together. 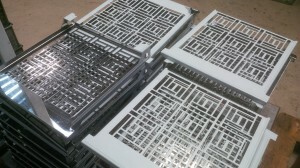 This batch of work was about 500 covers and suited perfectly our CNC punching and CNC bending capacity. 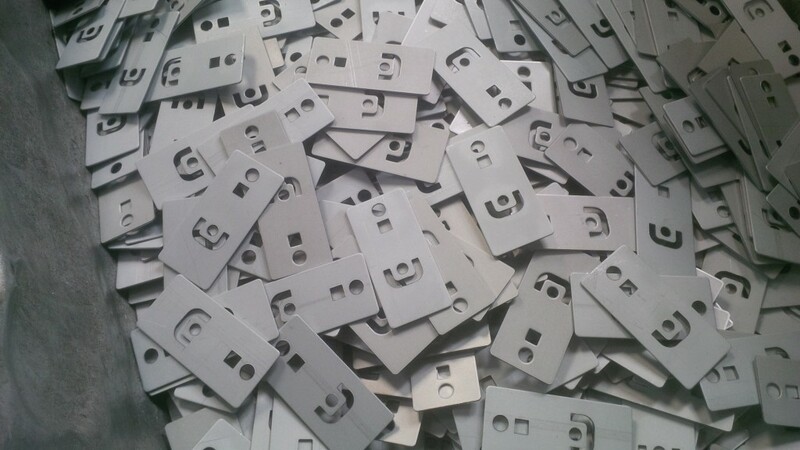 We can make sheet metal components anywhere from single samples, through to repeating batches of several hundred to larger batches and call off orders of thousands. With CNC sheet metal manufacturing plant the ability to change tooling quickly lends the process to adaption to each design without the need for expensive dedicated tooling. This has enabled us to manufacture sheet metal components that would have needed expensive dedicated tooling not that many years ago and today we just write a CNC program for a laser cutter, CNC punch press or CNC press brake and move straight to production. 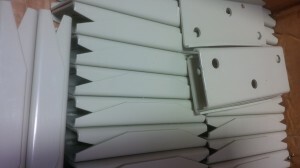 Here’s a more detailed view of the folded end tabs on the covers. It’s a great example of just how flexible sheet metal design can be with one single sheet of metal being formed around a curve and folded in many different ways. With this type of manufacturing we can adapt the CNC programs and hence the part whenever a design change is needed quickly with little or no cost to you the customer. If you have a design that needs folded sheet metal work please give us a call or e-mail your drawings and we will be happy to take a look for you. One of our CNC punch presses being used to punch out 1.2mm thick 304 stainless steel sheetmetal panels. 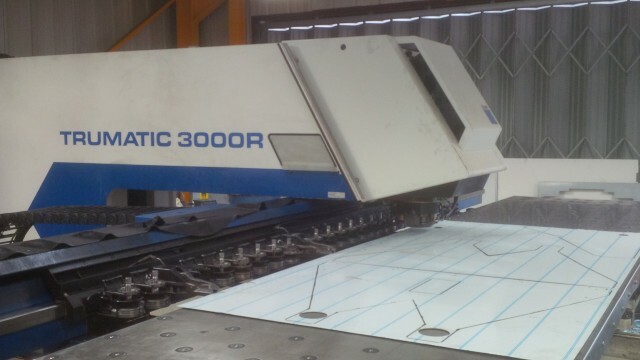 This particular CNC punch press is a Trumpf 3000R which can punch holes and forms all over a 2.5M x 1.25M sheetmetal panel without having to re-position the clamps. This helps to maintain positional accuracy of large sheetmetal components and saves time within the machine cycle. 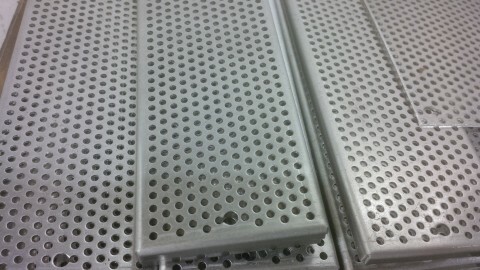 CNC punched sheetmetal chassis housing blanks for pumping units. 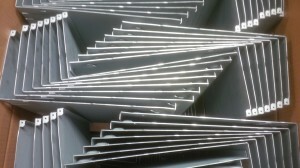 These parts have been stacked 2 sheets thick ready to be broken out from their punched sheet nests. The sheetmetal is Zintec, a zinc coated mild steel which is often used in internal sheetmetal components within the electronics and lighting industry. 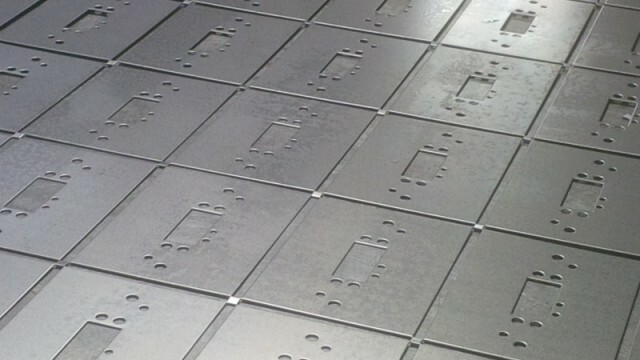 Sheetmetal mild steel connector panels produced on our Trumpf 3000R CNC punch press. This sheet of components shows really nicely how useful it is to be able to common line cut to save material and time with shared CNC punching of profile slitting using a 70.0mm long x 5.0mm rectangular wide punch tool. Bending up features on a Trumpf CNC punch press is possible with Trumpf multi-bend tooling. 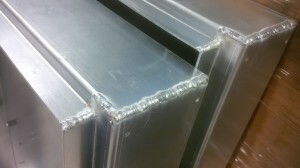 Not all sheet metal work bending is done on specific sheet metal bending machines. Yes of course if a sheet metal component is long, complex or thick it will need to be bent up on a CNC press brake. 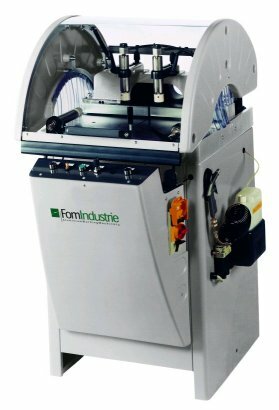 This is a machine that can be programmed to produce a wide range of bend lengths, widths, angles in all sheet metal materials and thicknesses. If however a simple sheet metal component only has simple bends it may suit being folded up on a CNC punch press with special tooling as show here. There is an advantage in the speed these small folds can be produced in any sheet metal component thereby helping to keep the overall component price down. If you want us to take a look at your sheet metal work and see if we can reduce your prices please call us on 01489 577786 or email us through the website. Please click on this short video to see how quick our Trumpf 3030 3kW fibre laser can laser cut through 1.2mm zintec sheet metal. The laser cutter really does go that fast when cutting a profile and considering we do not need to deburr these parts after they have been cut it makes for a very efficient manufacturing process. There was also another gain in that these parts were laser cut using compressed air rather than nitrogen or oxygen which saved more money as well. Here’s a clever idea. 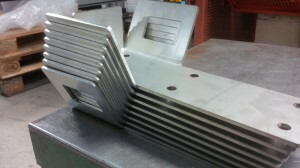 We can CNC punch out sheet metal work with small bends formed at the CNC punching stage. These components were both manufactured from stainless steel and had a variety of folded features built into them. The advantage is the speed of bending compares to even the fastest CNC bending operation and the reliability of the bends. While the CNC punch press is getting on with punching out these parts and bending them up the operator can be organising the next sheet, setting up tooling for the next job or de-burring components making the whole operation more cost effective. If you want to know more about CNC punching sheet metal work there are plenty of pages on the website that can be of help or if you have something more specific please give us a call or e-mail a drawing. When working with any complex sheet metal component we tend to start with a 3D model in our Radan CAD/CAM software system. The 3D model is created with reference to the material type, material thickness, profiles sizes, hole sizes and hole positions. Once the 3D model is complete it can be used to check hole alignment with other sheet metal parts that we may be manufacturing for our customers. At this stage it’s easy to see if there is a problem with the 3D model or our customer’s drawings and report back to them before committing to laser cutting or CNC punching any sheet metal material. We can either send the 3D model as CAD data in a *.SAT or *.STEP format. For customers who don’t have a 3D facility themselves we can offer 3D images and 2D CAD data in a *.DXF or *.DWG format. Once the model has been approved it is used to create the flat pattern needed for manufacturing. Having created the 3D model in our Radan CAD/CAM software, unfolded it and tooled it up ready for cutting we have to obtain the best fit of the flat blanks within a standard metal sheet size. The most popular commercially available sheet sizes are 2m x 1m, 2.5m x 1.25m and 3m x 1.5m but we can always use small off cuts from other jobs of buy in special blank sizes for production jobs to reduce material waste on awkward shapes. The CAD/CAM software automatically finds the best fit taking into account the grain direction on the sheet. We can always intervene if we want to change a position of a component or can see a more efficient nest layout. 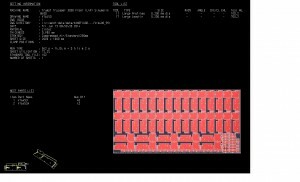 Once the component layout has been completed, which normally takes just seconds, we can create a compiled file which is used to drive the actual laser cutting machine to cut the components required. The laser cutting program that is generated from the CAD/CAM software instructs the machine setter in what material type is needed for the job, it’s thickness, the laser cutting assist gas that will be used and the nozzle size needed to produce a clean laser cut edge. The software takes most of the decisions and makes the Trumpf 3030 3KW fibre laser cutting machine set up from one job to another a simple task, often being just a matter of minutes. Once the material is loaded onto the pallet changing bed of the machine the operator can cut a component, stop the machine, check the part for size and edge cut quality and then run the production batch needed to satisfy the order. The whole laser cutting process is automatic and carried out inside the machine with the machine operator only able to view the laser cutting process through a special filter glass window. Another advantage of using a laser cutter to produce sheet metal blanks is that there is no tool clamping zone on the sheet so the laser cutting head can cut over the whole sheet leaving very little waste material, which all adds up to more competitive piece part prices for our customers. If at the end of a production run more sheet metal work is needed to complete an order the laser machine setter can create his own program at the machine for a small quality of parts with the need to create more full programs. Please click of the video to see our Trumpf 3030 in action laser cutting the sheet metal nest illustrated above. The video has not been speeded up this is the speed that it cuts 1.2mm zintec with compressed air. 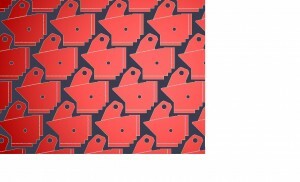 The laser cut blanks are produced from 1.2mm thick zintec sheet with 20 being cut from a standard 2mx1m sheet. With the Trumpf 3030 3KW fibre laser we have the option of laser cutting using either Nitrogen, Oxygen or compressed air. The Nitrogen gas is used to produce a clean cut edge as it’s inert and prevents oxidization while the material is cut. It’s perfect for aluminium, stainless steel and mild steel along with its zinc coated derivatives. The Oxygen gas is used when thicker steels need to be cut e.g. 5mm and upwards or when parts are zinc plated and the surface oxide is removed on the plating process. Compressed air is perfect for thinner sheet metal parts out of aluminium, mild steel or stainless steel. These zintec coated mild steel components were cut with compressed air which was perfect and the cheapest option of the 3 cutting gas types. Here is the tooling set up on one of our Trumpf 7036 CNC press brakes. The component is taken from flat blank to the final folded part is a series of bends across all 3 of the tools shown here. Once generated, the program to control the machine is saved away on our system server and is available for both CNC press brakes with interchangeable tooling making a flexible option when repeating batches. The CNC press brake control has a 3D graphical interface making it easy for the machine programmer to see if the component will be achievable with the tooling selected and also acts as a teaching aid to new operators when first folding a new job. After 3D software modelling, developed blank part generation, part nesting, laser cutting and CNC bending we have the final parts. In this case the parts were left un-finished in a zintec coated mild steel material which was more than adequate for our customer’s needs. If you want to see more videos of our laser cutting machine working or sheet metal manufacturing in general please visit our YouTube channel. If you have a sheet metal work project that requires laser cutting or CNC bending please give us a call on 01489 577786 or send us an e-mail with your details and we will be happy to provide some quotes for you. This sheet metal work project going through our factory in November 2014 is typical of the work that we are doing everyday for our customers. These parts were made in batches of 50,100 and 200 across a range of styles and sizes. These 304 bright annealed stainless steel sheet metal ventilation panels have been CNC punched out and CNC bent up all on Trumpf manufacturing equipment. The white colour is the peelable plastic protective film that we leave in place during manufacturing to help protect the cosmetic surface of the stainless steel from scratched and dirty marks while being CNC punched and bent up We are very proud of the investment that we have put into high tech equipment and the advantages it brings to our customers. 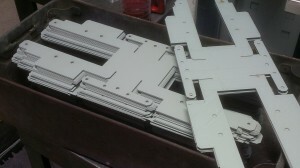 If you have a sheet metal work project that requires simple or complex bracket then we are the people to help you. These mild steel bracket were laser cut in house and then folded up on our Trumpf 3030 3Kw fiber laser cutter. 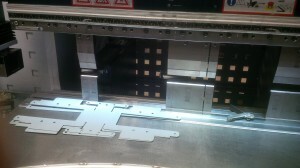 The brackets were then folded up on our Trumpf 7036 CNC press brakes. They could have just as easily been CNC punched out on one of our Trumpf CNC punch presses and bent on our larger Edwards Pearson CNC press brakes. We like to have a range of machines for each process giving us the flexibility to swap jobs about if a customer has an urgent order of if we have a large demand for capacity on any one machine. 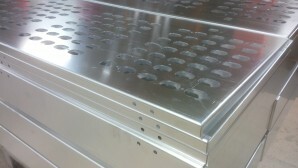 Sheet metal covers, boxes, lids, housings and enclosures are our everyday work. These zintec coated mild steel covers have been CNC punched and bent up in the first few days of November 2014. They will go off and be powder coated and then shipped to our customer. If you have a sheet metal work project you want us to take a look at for you pleas simple call us or send and email with your drawings, 3D data or photograph and we will be happy to produce a quote for you or give you some tips to help reduce the cost of your design where we can. Here’s a great example of the flexibility that can be achieved when manufacturing sheet metal work on a CNC punch press. These stainless steel chassis panels have been CNC punched from 304 1.5mm thick sheet using standard CNC tools but with some tabs being bent up with a special tool called a multi-bend tool. We have been using this tool for many years to enable us to speed up the production of sheet metal work with small bends by producing them on the CNC punch press rather than by hand on a press brake. 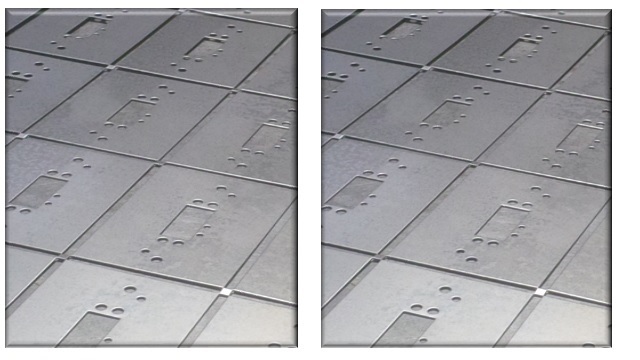 These mild steel plates have been manufactured by laser cutting with our Trumpf 3030 3KW fibre laser. They could have been CNC punched out but we didn’t have a suitable tool for the end radii. 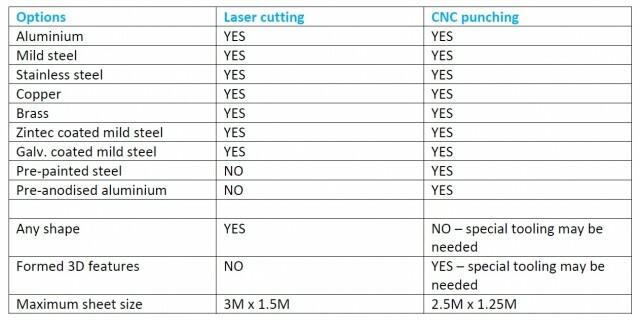 With a laser cutter you don’t have to worry about having the correct tool as the laser can cut any square, slot, circle or sheet metal profile with a continual laser beam making it the perfect process for small batch work and prototypes. The speed of the laser is also more than able to process larger volumes as well with it’s automatic pallet loading system. We have just started manufacturing stainless steel sheet metal ventilation grilles on our Trumpf 3000 CNC punch press here in Hampshire. 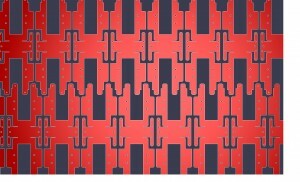 The pattern of ventilation slots has been created by using 3 new custom tools and repeating a punched pattern to produce a pleasing and efficient air flow pattern. The ventilation panels come in a range of sizes and materials with the ones shown here being bright annealed stainless steel and others being manufactured from zintec and having a powder coated finish. All the bends have been completed on our Trumpf 7036 CNC press brakes with minimum tool set up time. If you want to know more about CNC punching or CNC bending please follow these links to one of our web pages. If you are based in Hampshire or further afield and want some prices for your sheet metal work projects or technical design advice please give us a call or e-mail your drawings and we will be happy to help you. A view of a small zintec folded tray which had been bent up on one of our Trumpf 7036 CNC press brakes. All the bends were achieved from one set up and all bend lengths and angles saved on our network server for call back whenever the part is repeated. Having 2 of the CNC press brakes with identical program software and tooling enables us to move jobs around to suit work flow and keep machine down time to a minimum. Simple mild steel angle brackets that have been laser cut and CNC bent up waiting to have a press stud inserted before zinc plating and passivating. These parts are simple yet we used to have to guillotine the blank size then use a corner notcher to produce the 2 angles sizes, a radius flypress tool to crop the end rad, deburr the edges, flypress the holes and then set up a bending machine to produce a part like this. Now its just laser cut and CNC bent, job done, now that’s progress. Here’s a nice example of inline tagging being used on a CNC punch press. Each part is tagged at the end where the bracket comes to a point but it is also tagged in 2 places on each side where it touches its neighbour. This is achieved by using a special CNC punch tool shaped a little bit like a bow tie. The diamond shaped tags that are left when the component is broken out of the nest are not sharp and can easily be knocked off the side of the components. The components are bent up in the nest and sent to the customer ready for them to break out, saving bend time and break out time keeping the cost down for the final part. 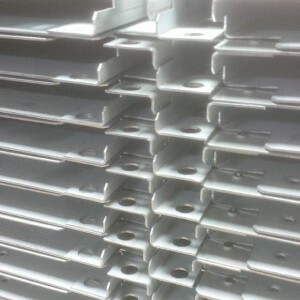 Galvanised mild steel brackets to mount electrical connectors. These brackets were CNC punched using standard CNC tooling that we had on the shelf. The holes and slots around the folded flaps were all CNC punched out first and then the complete disk was punched down a die the correct size in one hit. The punched out parts did not require any edge de-burring before a simple single bend operation on one of our Trumpf 7036 CNC press brakes. These brackets are typical of the sheet metal work that we produce with standard CNC punch and CNC bend tooling everyday of the week for our customers. Zintec coated mild steel brackets to support light fittings in an office ceiling grid. These small plates have been CNC punched out using a custom made L shaped CNC tool to produce the U shape that can been seen in the picture. 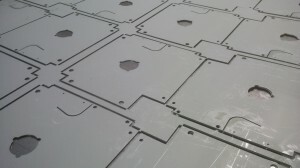 The final outer profile was also punched straight down a die using tooling that was specially made for these plates. We had to check out the cut size by cutting strips of metal and bending them up to accurately calculate the blank size needed for the CNC tooling. The part had several bends to produce the final shape and the cut size was critical. 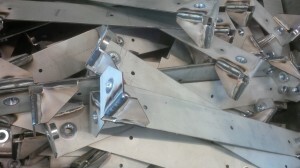 Stainless steel mounting brackets used to secure children’s playground equipment to posts. When we originally started to manufacture these stainless steel mounting brackets we CNC punched them out using one of our Trumpf CNC punch presses. Once we had the laser cutting machine in place we moved the job over to that machine. The laser cutter enabled us to produce a cleaner outer edge profile straight from the machine without specific edge deburring operations. It also enabled us to squeeze a few more from each sheet which helped to offset a rise in stainless steel material price keeping the part cost the same for the customer. As a by-product it also enabled us to produce the parts without as much noise in the workshop, always a bonus when working with stainless steel. The brackets were then formed with the curved section and tight V bend on our CNC press brake machines. The final operation was to give them all a gentle tumble in our de-burring barrel to remove any sharp edges around the outer profile, slots and holes. 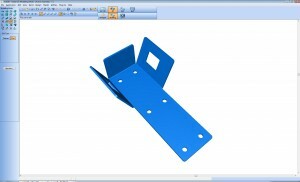 The volumes these brackets are manufactured in are 500 to 1000 so they perfectly suit CNC laser cutting and CNC bending. I often marvel at the complexity that can be produced in sheet metal components with the simplest of CNC punch press tooling. These 0.7mm thick aluminium lighting gear trays have been produced with some custom made tooling to pierce complex shapes in a single hit. 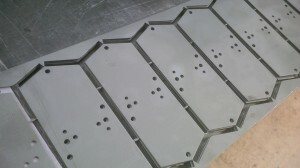 They have also been CNC programmed with a combination of rectangular slots, rounds and squares. 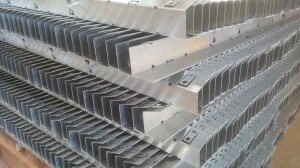 The overall effect is a complex sheet metal component that can be produced again and again. The advantage of CNC punching is the inclusion of taptite screw plunged forms and small bent tabs along the length of the gear tray without the need for any post punching operations. Here’s a great example of the repeatability and accuracy that can be achieved using the latest CNC sheet metal manufacturing equipment. Some of these parts were produced on our Trumpf 3030 3KW fibre laser with other parts and some were punched out on our Trumpf 3000 CNC punch press. Both parts were then folded together on one of our Trumpf 7036 CNC press brakes. They were all brought together and tack welded just the same producing a welded fabrication. Our ability to swap sheet metal parts from the laser to the CNC punches and back again when production loadings require it give us a great advantage in flexibility for our customers. This machine flexibility is also supported by the ease of using Radan software to program sheet metal parts across both types of machine allowing us to tool for either production method instantly. 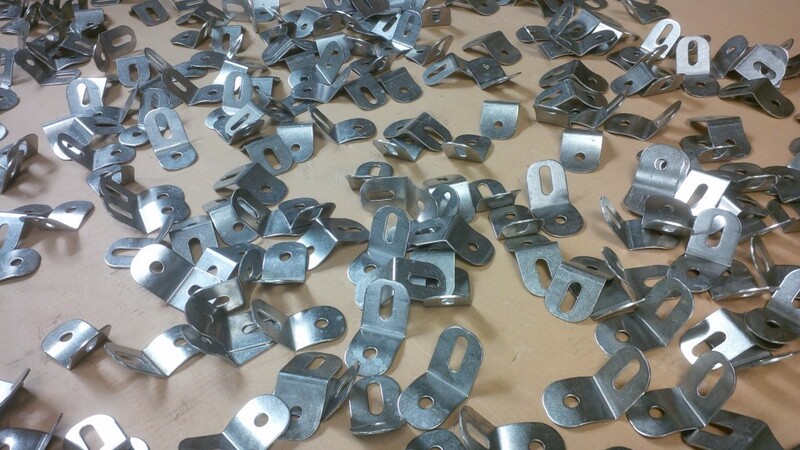 These small zinc plated mild steel brackets demonstrate the advantages of purchasing custom CNC tooling. The large window shape in the middle of the bracket has been CNC punched with one hit using a custom CNC punch press tool. This enabled us to produce the bracket nice and quickly when there were batches of 1000 to 2000 at a time keeping the part cost down and removing lots of nibble marks. If you have a sheet metal project and you not sure whether it might be beneficial to invest in some custom CNC punch press tooling just give us a call and we will be happy to provide you with quotes with and without tooling costs to see where the cost break points will be. Most sheet metal components that we manufacture here at V and F Sheet Metal start with us creating a 3D software model, the only exception being flat panels. The 3D model enables us to test out any hole alignment issues that might occur when assembling several parts together such as lids fitting on housings or front panels lining up with enclosures. We can use the 3D model to create a flat developed blank with the correct cut size calculated for any given material type and thickness. The 3D model also has the advantage of enabling us to show our customers any problems that we think may occur in manufacturing their sheet metal components before we have to start CNC punching or laser cutting any sheet metal. It also allows us to give some customers their first view of their part in 3D if they only use 2D CAD software. We are lucky and have some customers who also use 3D software and can output either SAT or STEP files which we can then read straight into our Radan CAD/CAM software speeding up the whole process of CNC program generation. The next stage after generating a 3D model is to create the CNC tooled part and then the part nest. A single sheet metal part is taken from the 3D model as a flat blank which is then refined and cleaned up to produce the profile needed for the customer. This part is easily tooled up for laser cutting with all the cutting lead ins and profile allowances calculated by the software. Then, as with CNC punching we can use the software to calculate the most economical fit of components for any given sheet size. 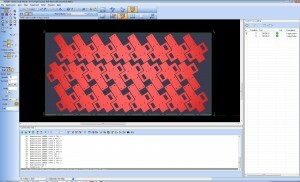 The software will also automatically find the quickest path to cut all the parts on the sheet so that the laser head doesn’t travel over any areas that have already been cut, reducing the risk of head collisions with sheet metal that might be protruding from the surface of the parent sheet and keeping heat build up to a minimum within the sheet. 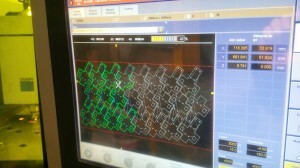 This image perfectly illustrates the Trumpf laser cutter controller with the job cutting in progress. The green parts on the screen have been laser cut and the grey are still to be cut, so at this stage 10 and a half parts have been laser cut. The path will follow exactly that which has been laid down by the Radan CAD/CAM software and output in the compiled laser block file. The operator has control over the speed of the cut, gas flows, nozzle size and focus but cannot change any design details of the components being cut. You can just see inside the laser cutter (on the left hand side) through the filter glass, the operator has a view of the machine while it’s cutting being able to monitor cutting progress and act on any error messages that may arise on the control at the same time. Here’s a view inside the Trumpf 3030 fibre laser machine as it’s cutting the 4mm thick stainless steel sheet. You get a good idea how close to the edge of the sheet we can program parts and laser cut them enabling us to use as much material as possible keeping the component part prices down for our customers. The image has a yellow/green look as it’s taken through a special filtered glass door which is essential on fibre laser machines to filter out certain light wave lengths given off by the fibre laser that could be harmful to the naked eye. The operator can stop the machine at any time open the safety doors, reach inside and remove a part to check the edge quality, change a parameter if needed and then safely resume cutting from the same point without wasting any material or potential finished components from a sheet. If more than one sheet is required to satisfy the order volume the Trumpf 3030 3KW fibre laser cutter has a pallet changer that allows a cut sheet to be swapped with a fresh sheet of metal automatically to keep the laser cutter working while cut parts can be removed and another fresh sheet loaded on the pallet changer. 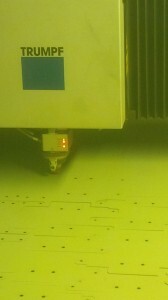 And here’s the Trumpf 3030 3KW fibre laser in action cutting straight through the 4mm thick stainless steel plate. 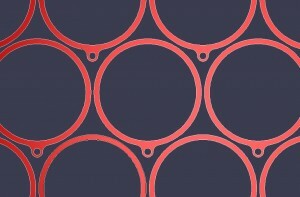 The laser cut edge quality means that no other de-burring was needed on these parts. One of our Edwards Pearson CNC press brakes being used to fold up the stainless steel blanks into brackets. And finally the stainless steel brackets being folded up. It’s not that easy to see here but the tooling we use on this machine enables us to fold more than just 90 deg bends, this type of V tooling is called air bend tooling. We can fold up angles from just a fraction of a degree to approx 30 deg inclusive angle, if we need to fold a component right over into a dutch fold (safe edge) we apply a second bending operation to flatten down the V bend. The back stops behind the CNC press brake tooling can move from side to side and in and out towards the tooling. This enables us to program in different bend lengths, bend angles and a range of bends on the same part along the full bed of the machine if necessary so that a completed component can be produced in one series of bends rather than having to set the CNC press brake several times for each bend type. This enables us to produce the first finished component much faster for inspection and on a large batch of parts we can part batch if needed to get an urgent job started for our customers. The final bracket has been processed through the CAD/CAM software from a 3D model, laser cut and CNC bent all within our production factory in Fareham, Hampshire. There were 2 slightly different brackets run together with slightly different angles but all the same manufacturing processes and materials, the flexibility of CNC laser cutting and CNC bending allows us to easily use these machines to make a range of parts with minimal set up times and fuss. If you have a sheet metal project that needs laser cutting, CNC punching or CNC bending please let us take a look and see how we can help remove cost from your parts. 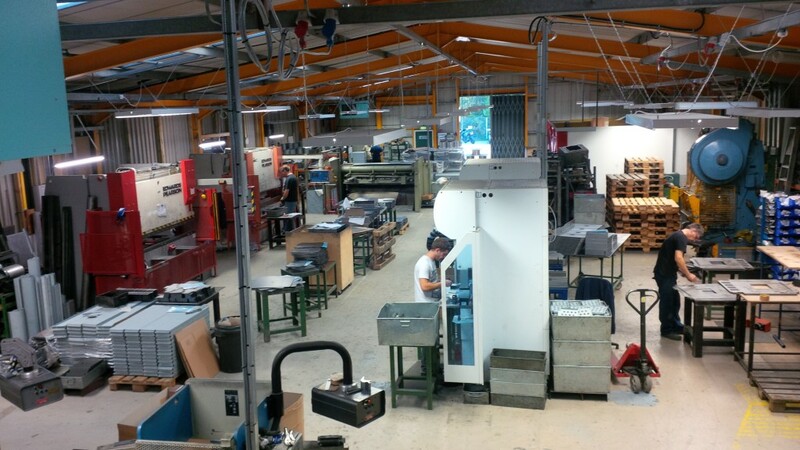 Here’s a quick snap shot across our main factory area showing all our bending machines in action. Sheet metal work can start in the CNC punching and laser cutting area and then be transferred into the main factory production area you can see here. The red and white machines on the left hand side are both able to fold sheet metal sections up to 2.5M long and well as take a range of specialist tooling for curved components and press tools for production work. The white machines in the middle of the picture are our newest Trumpf 7036 CNC press brakes which we use for all our small sheet metal work up to 1M long. They are very quick to set up and have a great accuracy which is perfect when repeating batches of work again and again using the same CNC programs and tooling. The person on the right hand side of the image is preloading sheet metal panels with studs before they are pressed into the job using our Haeger bush inserter machine. Further down the factory on the right stands our HME 55 ton power press which we still use on some projects where press tools are needed for higher volumes. And finally in the distance on the right we have 2 welding bays for TiG, MiG and gas welding. The work flows from machine to machine as needed on any particular job and finally to inspection and goods out. Having such a range of sheet metal manufacturing equipment means we can turn our hand to most jobs for people. The CNC punching and laser cutting machines are housed in a separate area within the factory enabling us to contain the noise in one area when we are CNC punching thicker material or stainless steel sheet. It also works well for us keeping all the sheet metal together and when the factory doors are open for unloading packs of material we don’t have cold air coming into all the factory. Just another day at V and F Sheet Metal and I spot brackets being manufactured in aluminium, mild steel and stainless steel. 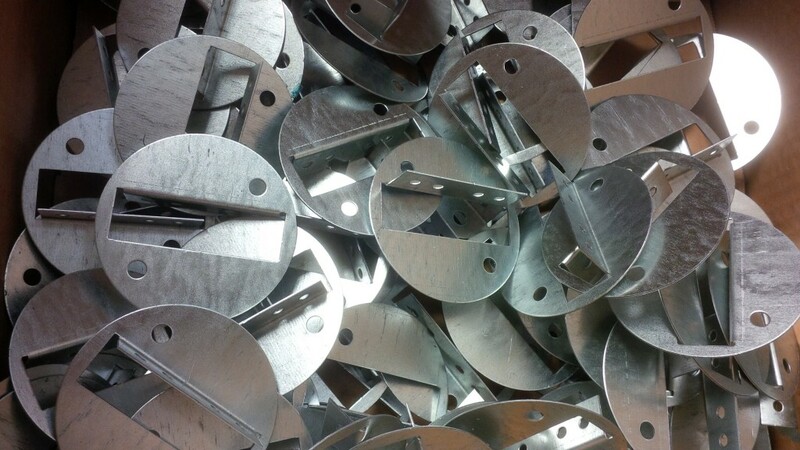 These small aluminium sheet metal angle brackets are typical of the manufacturing projects we are producing all the time. 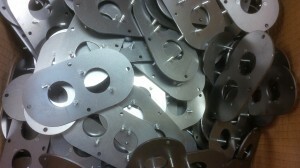 The have been CNC punched and bent up in batches of several hundred. The final brackets didn’t need to be edge deburred or painted as these were being used inside a larger housing and wouldn’t be seen by the final customer. 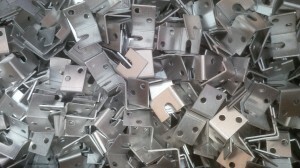 Simple stainless steel brackets cut and folded from 0.9mm thick material. Items like this we all walk past and pay little attention to until the moment that our customers need the to finish an import order and then they become the most important sheet metal bracket in the world! 3mm thick angle brackets laser cut using oxygen as the assist gas to produce a smooth burr free outer profile. 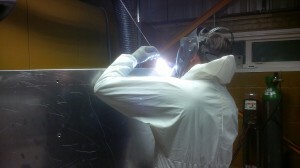 Any oxide burning on the cut edges will be removed when the parts are zinc plated and passivated. 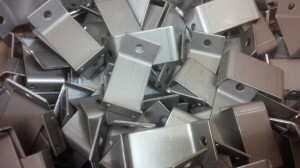 If you have any sheet metal brackets that you need manufacturing give us a call or email your drawings and we will be happy to quote for your project. 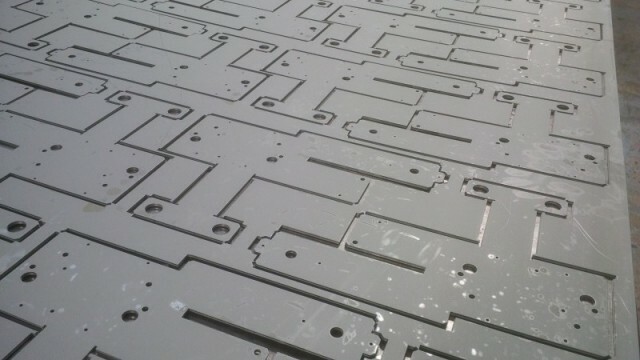 Here’s a small section of a much larger CNC nest program that filled up a 2m x 1m sheet of metal. We only have to worry about programming 1 part and then the software takes care of finding the best most efficient pattern wasting as little material as possible. The programming software even picks the fastest route through all the parts so that the laser cutting head doesn’t have to keep going over sheet that has already been cut. This image shows just one type of part nested over a whole sheet but the same principle works with multiple part types on a nest. 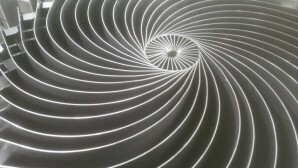 This image shows a CNC laser nest used to laser cut out 4mm thick 304 stainless steel plates. The panel on the right hand side shows us the different profile conditions for the holes and outer profile. The bottom panel shows the order cutting text where we can later the order that features and parts are laser cut. The main window shows the parts as they will appear within the actual sheet of metal on the laser bed. We can simulate the cutting sequence to verify that all parts will be cut and that there won’t be any problems with parts flipping up and catching the laser cutting head. This view shows all the information that can be used to aid production staff when manufacturing a component. Not only is there the nest shown filling a standard sized sheet of metal but there are notes giving part numbers, laser cutting run times, assist gas types, sheet type and thickness information as well as a 3D images and dimensions bends ready for production. It’s easy to provide a print out of this information to go with the customer drawing and route card to answer most of the questions setters need when setting up each work centre. 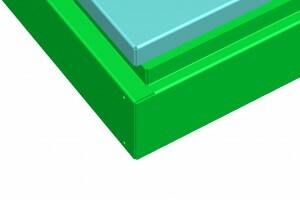 For more information on Radan sheet metal software follow the link or give us a call. 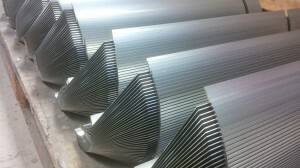 Sheet metal work here at V and F Sheet Metal can be very diverse on any day of the week. These images just show 3 sheet metal projects taken a random being worked a busy workshop. During a month we produce hundreds of different items from parts as small as your little finger nail to section 2.5M long. The top image is of Zintec coated mild steel brackets with seam welded joints. 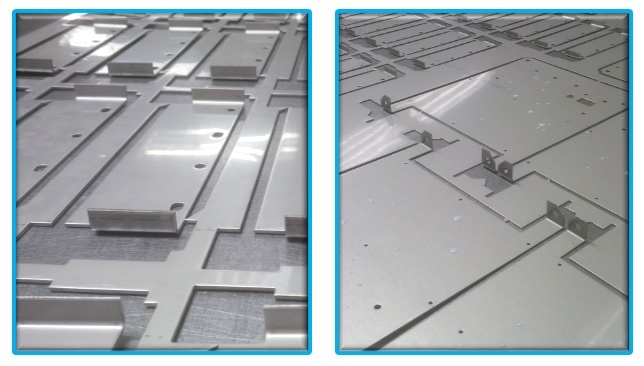 The middle image is mild steel U shaped folded channels powder coated and the bottom image is Zintec again being CNC punched on one of our Trumpf CNC punch presses. The need to have a diverse range of production plant and skills keeps the job interesting and enables us to offer many services to our customers. Our customers rely on us to help them with their designs, suggest the best production methods and where they can save money. We are more than happy to help if it means improving their designs for manufacturing saving them money and then enabling them to sale more product themselves. We are always investing in new production plant to speed up the manufacture of sheet metal work, improve the quality of finish and maintain cost effective parts prices for our customers. 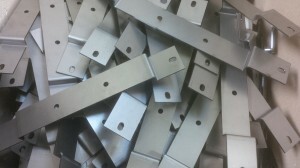 These CNC punched parts have common line cutting on one edge. 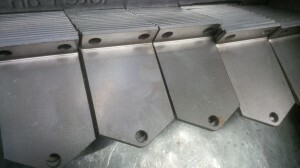 The slit tools can be shared along this edge reducing the number of hits needed and therefore the time taken on the punch press to produce the parts. Even a few hits on a large batch or batches of parts that repeat often save the customer money and that’s what’s its all about.